I just got my new passport in the mail last week because little did I realize before heading off to Indonesia this summer, I was already approaching the time to renew it which is December of this year. However, most places won’t even let me in if the passport expires in six months, so I went out to take care of it as early as possible. 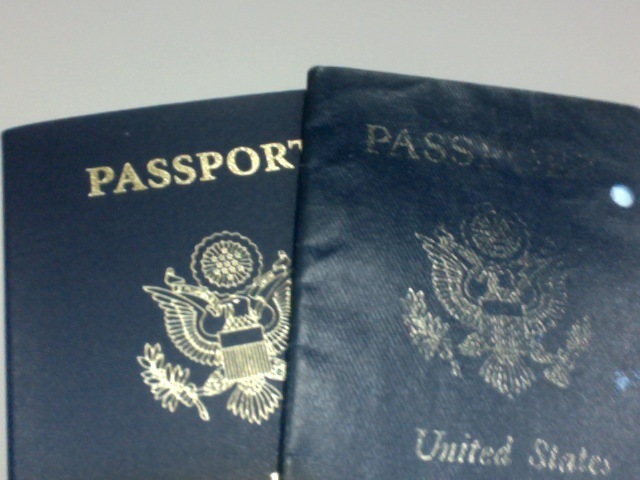 I like to see these two passports as bookends to the life I lived this decade. The person who I was as symbolized by the old, worn-out passport is like a snake shedding its skin, the caterpillar that becomes a butterfly. All my travels recorded by every visa stamp, and the new layout and a lot more pages in the new book symbolize that there’s many more adventures to be had. I often think whenever I travel, that I become the person in my passport. Ever hear how your driver’s license picture isn’t really you because of how awful the quality of those photos are? Well, it’s the same with passports. However, once you get on a plane and go to the next place, it’s not your passport, your hometown, your job, your ethnicity–none of that defines you: it’s that you and everyone else on that plane are going somewhere. Even when I have obstacles to travel (whether it’s money, life events, visa restrictions, or travel bans), just knowing that this booklet here says that if I can hop on an airplane now and go anywhere else is liberating. I always wonder why I don’t get to use it as much, but then again, even with where I have lived in and traveled, which is only six countries and a handful of states, I always say “only six countries and barely over ten states”. Compared to my other global nomad/Third Culture Kid friends, I don’t consider myself well-traveled at all. Ten years ago, I always wondered when I could travel. There would be days I’d wonder where my father would go, when I could be rewarded with the time and money to do it, or what I needed to do before I could live my dream. It wasn’t easy seeing how my father used to tell me to save money (namely his) and focus on school, while letting my sister go to Spain, France, Korea, Malaysia, and various other places to see her friends. Back then, I allowed myself to let others tell me when and where I could go, and had lots of baggage–literally and figuratively. Right now, aside from a small library of books and a few kitchen essentials, plus my altar, that can all be packed into several boxes and left in a friend’s apartment while I carry only what I need: a backpack, a laptop, and camera. I don’t need anything more besides my skills and wits, and I plan on making friends along the way while I go out to save the world, get the girl, and come home in time for supper. This passport is the new me until April of 2022. When the next passport comes, we will see what lessons I have learned between this day and the day I look at a new picture in the next passport. As of now, this is who I see myself as: a young man, confident, adventurous, compassionate, loving, altruistic, loyal, generous, artistic, athletic, chivalrous, and fearless. Where will I go, as evidenced not just by the visa stamps in the pages of this passport, but by the wear and tear from carrying it in my pockets, my backpack, or hiding it in my drawer? Who will I still call friend and who will become my new comrades when I list whom I’m traveling with before entering the next destination? What will I look like by the time the next passport picture is taken? Lastly: will I ever find that place called “home”? Paradise seems like a distant idea, but home seems ever elusive for me. Until then, I’m going to keep traveling. And now you can follow my adventures through not just my pictures and words, but my films. This entry was posted in Asian and Asian-American, Globalism, Life, Third Culture Kids, Travel. Bookmark the permalink. Hey Johnny, I thought your video was brilliant. You make some great observations. Found it difficult to hear what was being said near the end though as the music was so loud. Perhaps a second episode with a video response from Cecelia? Thank you, yes I discovered very quickly that what I thought was not loud enough for music ended up being far louder than I thought. But I’m new at this, so by next episode, audio quality should be rectified (I’ve only had the software for a coupe weeks and am self-taught). Additionally, the story of Sisilia is actually the main focus of the first season, as her response will be what I am working toward when I get to Indonesia. I am also planning to change my citizenship for the very same reason as you — the liberty that passport would give me in terms of travel, as well as less hassle with immigration checkpoints etc. You often said you have no sense of national identity anywhere and that you don’t feel that the US is truly your home. Do you feel guilty about it? I’m having second thoughts about my citizenship application for the same reason. While I am comfortable and relatively well-adjusted in that society, and I do care about what happens in that country, I don’t have any patriotic feelings about it. Sometimes I feel quite bad about intending to get that passport just to get the advantages, without really having the right sentiment to go with it. I don’t think anyone needs to be loyal or patriotic to deserve citizenship. Sometimes it’s an accident of birth, sometimes it’s a privilege. As far as the context of immigrant countries I’ve lived in, even those without citizenship fight hardest for the country they want to live in and be part of, so they are more American than the accidental denizens who were born in the U.S. but have no idea how grateful they should be to have that privilege. People who are illegal immigrants and don’t even have permanent residents in America and Canada were more patriotic than my cousin and me, so I wouldn’t feel too bad about your perceived “betrayal” of nationalism and patriotic duty. Think of it like being in a cult: to people who aren’t there hearing you say you are in the best country in the world and everyone else will never be as great–you sound quite silly. So don’t worry about being a non-patriot and use that because it’s about you and your values and eventual community.